Artist Kim Bernadas offers sculpture classes in New Orleans with courses of study for the novice as well as the professional. Students will be guided through the process of modeling a portrait or figure from life using traditional water-based clay with or without the use of an armature. With a focus on gesture and proportion, the student will learn key observation skills directly from a live model, to bring about a better understanding of structure and form. Teaching methods will include hands on demonstrations, as well a discussion in classical ideology of the human figure and its form. 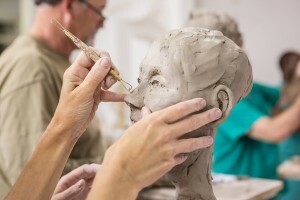 The course is appropriate for students of all levels who have an interest in sculpture. In 2006, her teaching skills her sculpture instruction became an integral part of a concentrated study offered to the plastic surgery residents of two medical Universities – Tulane and LSU. Anatomy, symmetry and the relationships of individual features are emphasized to create an aesthetic approach in an effort to further enhance a medical procedure. Classes available for 3-5 day workshops at your desired location, as well as private instruction in the artist’s studio in New Orleans. Kim is also on faculty at NOAFA, where courses are offered on a semester basis.